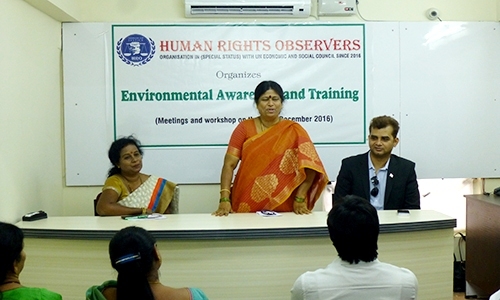 Speaking on the occasion prominent senior advocate smt. Venkateshwari, stated that Violence against women and girls, a gross human rights violation, devastates lives, causes untold pain, suffering and illness. She has described violence against women has become a matter of serious concern she vows to create awareness among the women leaders and she vows to encourage women to come forward and take a leading role to protect women rights violations in every aspect of life. Chairman of Human Rights observers Mr. Tameem speaking on the women rights issue he said number of women face compounded forms of discrimination — due to factors such as socio-economic status — in addition to their gender. He also said that Effectively ensuring women’s human rights requires, a comprehensive understanding of the social structures not only laws and politics but also the economy, social dynamics and family and community life. Tameem In his speech Strongly condemned he said It is a grave violation of women’s rights and it causes devastating physical and psychological injuries to women everywhere. 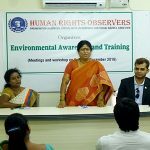 Speaking on the occasion Keerthi Kondapuram of Human Rights Observers said Violence against women and girls is an extreme manifestation of gender inequality and systemic gender-based discrimination. The right of women and children to live free of violence depends on the protection of their human rights and a strong chain of justice. She said these human rights violations pose serious consequences for current and future generations and for efforts to ensure peace and security, The effects of violence can remain with women and children for a lifetime, and can pass from one generation to another. She said we all know that we have to do much more to quickly respond to the cries for justice of women and children who are in a desperate need of support. We have to do much more to end these atrocities and the impunity that allows these human rights violations to continue.